Nor was I for Ross Perot, a man who (as of 1992) had made a $3 billion dollar fortune and headed a major hi-tech corporation, actually two. But he was—let’s be frank (and rhyme)—a real crank. Frankly, I can’t remember whether many people took him seriously as a thinking politician. Still, with his money he seemed able to stake a claim on the attentions of the electorate and attracted the support of millions of voters who would not have gone to the polls were their choice limited to either George H.W. Bush or Bill Clinton. His running mate, retired vice admiral James Stockdale, much decorated and the highest ranking officer captured by the North Vietnamese during the Indo-China war, could not make heads-or-tails of the issues at stake in the election. At the top of the ticket, Perot staked out the “balanced budget” as his own and with the intensity of Ron Paul. Yet he had a habit of going in and out of the race, blaming Republicans for causing all kinds of mischief in his own and his family’s private life, including his daughter’s impending marriage. Nonetheless, he was taken seriously by the press and credited or debited, as it were, with President Bush and Dan Quayle’s defeat and Bill Clinton and Al Gore’s victory. Nobody, however, would suggest that Perot had a legitimate claim on the presidency were it not for his cash, and many oodles of it which made him even more legitimate. 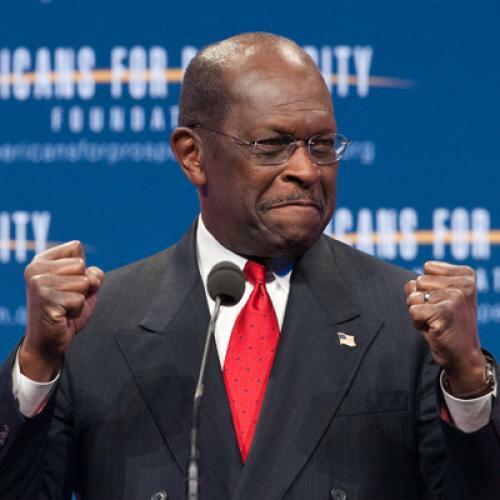 Herman Cain is also a rich man, but in dimensions so much lower than Perot that he comes across as a middle class man. In any case, there are at least two real multi-millionaires in the GOP race. One is Mitt Romney, the “other” front-runner. He inherited a good deal of money from his father, George Romney, who was CEO and chairman of the company that made Nash cars, which tells you how long ago that was. He made an issue of gas guzzlers by offering the public the Rambler, a success of sorts … at least for a while. Then, dad ran for the 1968 Republican nomination for the presidency and was, also for a while, the front-runner. Until, that is, he confessed that he had been “brainwashed” by the military on Vietnam. (Of course, we were all brainwashed on Vietnam, the right by the military, the left by the “idealists” who persuaded us that the Viet Cong was an idealistic peasant insurgency rather than a mask for the vicious government in Hanoi. No, Ho Chi Minh was not a good man. He was a butcher.) Anyway, George’s stock plummeted, his own stock. He did not become the nominee. Richard Nixon was selected. And he, as you know, became president, a virtual criminal and perhaps the most vicious of the 37 men who had preceded him. Almost nothing was made of the fact that the senior Romney was an elder of the Church of Latter Day Saints. Now back to Mitt and his money. His inheritance aside, he’s very very rich—they say more than $300 million—from his own work as CEO of both Bain & Co. and Bain Capital, key and early players in the new economy and without ever having improprieties charged against them, which, alas, is a rarity now. He ran for senator against Ted Kennedy and lost. He was chief executive of the 2002 Winter Olympics, in which position, Wikipedia suggests, he earned the reputation of a “turn-around artist.” Then he ran for governor in the Bay State, won, and served for four years, honestly and more or less responsibly. I think I voted for him since a bore of a Democrat, Shannon O’Brien, had defeated three friends of mine who ran against her in the primary: my student Tom Birmingham, former AIPAC national chairman (later chairman of the Democratic National Committee) Steve Grossman, and then-Brandeis economics professor Robert Reich, now at Berkeley. Romney kept the state out of debt. Along with Cain, he’s now the front-runner for the Republican nod. The main issue against him is his Mormonism. Here is an area where America has become more and more bigoted. A pastor who supports Rick Perry called the Mormon church a “cult.” But aren’t all of our religions, whether we believe in one of them or not (and I do believe in one of them, quite fervently), really and finally cults? What the Mormons believe is not intrinsically more unbelievable than what the established faiths believe. It’s just that their miracles occurred in the nineteenth century. And Catholic miracles actually “happen” in the twenty-first century. Anyway, Cain has no religious troubles. He is charged with sexually abusing women in his employ long, long ago. And, if it’s a habit as these tendencies tend to be, it is likely to come out. However, he has resolutely denied the charges. I have not the slightest idea of whether the accusations are true. But I hope that there will not be a widespread assumption that the complaints are accurate without further proof. The question of proof, moreover, is also often contorted. And paying someone off to be quiet is certainly not evidence of guilt. Sometimes it is just getting rid of a nuisance. U.S. Supreme Court Justice Clarence Thomas never paid off anyone. So there wasn’t even a simulacrum of hard evidence against him. What there was was a campaign against him. And accounts of his loose talk. He was confirmed by the Senate. But Anita Hill won the case in public opinion. No Supreme Court justice has gone to the court with more rancor against him than Thomas. The clincher in the argument against him was, as Hill, then a professor at the law school of the University of Oklahoma, put it, that Thomas had harassed her with inappropriate discussion—yes, inappropriate discussion, not improper physical deeds—of sexual acts and pornographic films after she had turned him down for a date. As of this writing, at least, we are still learning what the actual accusations against Cain are. But the two most incendiary opponents of his in the Republican contests are Michele Bachman and Rick Perry. This will be an elevating contest. Linda Feldman in the Christian Science Monitor reports that the ABC News-Washington Post poll “conducted in the days after the harassment allegations surfaced shows that Mr. Cain’s numbers among Republicans have risen over the last month.” He is now at 23 percent and Romney at 24 percent. A month ago, in the same poll, Cain polled 15 percent and Romney 25 percent. And, as everyone knows, Cain is a black man. True, many of his convictions are Tea Party dogma; but even so, how is it possible that one-quarter of Republicans support a black man for president? It would be amusing, wouldn’t it, if the president’s opposition next year were to be this former restaurateur, the CEO of a chain of pizza parlors.